Copyright 2015 John Wiley & Sons. 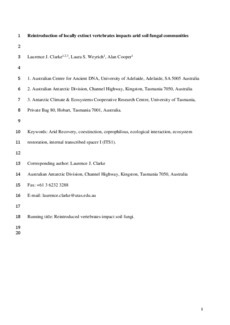 This is the peer reviewed version of the following article: Reintroduction of locally extinct vertebrates impacts arid soil fungal communities, which has been published in final form at http://dx.doi.org/10.1111/mec.13229. This article may be used for non-commercial purposes in accordance with Wiley Terms and Conditions for Use of Self-Archived Versions. Introduced species have contributed to extinction of native vertebrates in many parts of the world. Changes to vertebrate assemblages are also likely to alter microbial communities through coextinction of some taxa and the introduction of others. Many attempts to restore degraded habitats involve removal of exotic vertebrates (livestock and feral animals) and reintroduction of locally extinct species, but the impact of such reintroductions on microbial communities is largely unknown. We used high-throughput DNA sequencing of the fungal internal transcribed spacer I (ITS1) region to examine whether replacing exotic vertebrates with reintroduced native vertebrates led to changes in soil fungal communities at a reserve in arid central Australia. Soil fungal diversity was significantly different between dune and swale (interdune) habitats. Fungal communities also differed significantly between sites with exotic or reintroduced native vertebrates after controlling for the effect of habitat. Several fungal operational taxonomic units (OTUs) found exclusively inside the reserve were present in scats from reintroduced native vertebrates, providing a direct link between the vertebrate assemblage and soil microbial communities. Our results show that changes to vertebrate assemblages through local extinctions and the invasion of exotic species can alter soil fungal communities. If local extinction of one or several species results in the coextinction of microbial taxa, the full complement of ecological interactions may never be restored.